Every year I bake pan after pan of Christmas cookies to gift and to bring to family gatherings. It’s something my grandma used to do long before I had my own kids, and I still remember her kitchen covered in trays of freshly baked goods, dusted with powdered sugar, jams simmering on the stove to fill them and the assortment of Christmas tins we’d lovingly pack them into as they cooled. Holiday baking can be overwhelming at times, but it can be an incredible memory-making experience with your children as well. Capturing those memories can turn something that may feel like work into a fun holiday activity for the whole family, and my kids are always so proud when we show up with cookies and they can say they helped roll and bake them. 1. Choose a recipe you know and love. 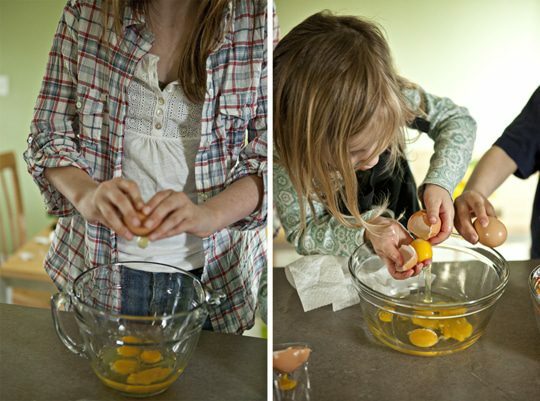 Picking a recipe you’re familiar with will make it easy to incorporate adding steps for your children to do because you already have an idea of how the recipe goes, what comes next and how it should look at each stage. If you are picking new recipes, try to choose recipes that aren’t too involved or that have room for error. Drop or rolled sugar cookies or muffins are always good choices. 2. Suit up. My kids always feel more involved if they have their very own apron on. This can be as simple as a dish towel tied around their waist. Plus, it helps with the clean up later. 3. Provide a fun environment. Start with a bit of holiday music and maybe an activity on the table to do during downtime. One of the hardest parts of keeping kids involved in baking is getting their attention the entire time, even during the parts they aren’t able to do themselves. Providing alternate activities they can do or things like music you can sing together while you work can keep the mood happy and light and keep them interested and involved. Below is a loose guideline of age-related activities to involve the kids in. Remember that all kids are different and mature at different stages. When choosing activities for your children, think about their personal interests, behavior characteristics and what you think they can personally handle. What are your favorite things to bake for the holidays?